Richard Branson’s Virgin Group has agreed to purchase a minority share of Miami-based Brightline. The company will be rebranded Virgin Trains USA as part of a licensing deal. Branson said that he first visited the Brightline operation a little over a year go. 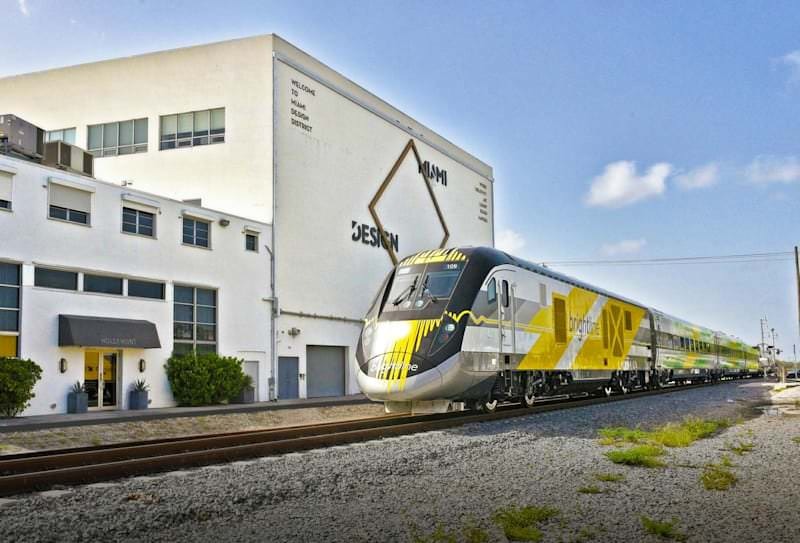 “It was clear from that our first visit that Wes Edens, Brightline’s founder, and his team had an exciting vision and the skills for American rail travel that no other private American enterprise has been able to do for a century,” Branson wrote. Virgin is also in the process of launching a new cruise line with headquarters in the Miami area. The first ships will be based in Miami. Today Brightline, America’s first new major private intercity passenger railroad in over a century, announced a new strategic partnership and trademark licensing agreement with the Virgin Group, one of the world’s most recognizable brands in travel and hospitality. The partnership will allow Brightline to leverage Virgin’s industry-leading expertise and customer experience to establish a powerful new brand, “Virgin Trains USA”. I could not disagree with you more. I have taken the trains many times and they seem mostly full. Downtown Miami alone has more than 100,000 residents and growing every day. “Faster and cheaper to drive through express lanes than Brightline”? NOT! The Lexus lanes at rush hour between Miami and the Golden Glades alone is as high as $15.00. On top of the express lanes cost, you have to add the cost of gas, wear and tear on your vehicle, etc. It’s not faster either. Rush hour in South Florida is bad. A day doesn’t go by that drivers don’t have do deal with accidents, broken vehicles (even in the Lexus lanes), road construction, etc. Have you factored what you do when you get to either Ft Laud or WPB? To the cost of driving, you have to add gas and mileage. Don’t like the new name, but I welcome Branson’s clout. High-speed train tracks being setup to reach Orlando International Airport… and the Station is already built.. in negotiation to eventually reach Tampa. They appear to want the Tampa leg up and running shortly thereafter. Not a multi-year gap like south Florida and Orlando. I’d like to hear more about that cruise line. Please place the HQ in downtown and not Doral like NCL and Carnival. Google it. Unfortunately, they put their HQ in Plantation. Brightline has moved its headquarters to a new office building next to its Miami station. The 12-story office building, located in downtown Miami, is part of the massive MiamiCentral mixed-use complex being built to house Brightline’s southernmost station. Companies nowadays prefer the views of the congested Palmetto vs Biscayne Bay. More employees live in the suburbs. It always makes my day when good news drops at The Next Miami on a Friday! We also have the ULTRA moving to its new home at Virginia Key! If this somehow helps save Marine Stadium it is definitely worth it. Branson is majority owner of Virgin Group which is strictly a private venture capital investment conglomerate with about $6B under their control. They are not operators of anything. They own 100% of Virgin Voyages (JV with Bain Capital), Virgin Vacations, VirginMegastores, Virgin Hotels, and more…but only 33% of Virgin Galactica, and 20% of Virgin Atlantic. For This venture, it seems they will pay enough for the naming rights and will not be part of the management or operations. what about the Virgin trains in the UK? Who’s down to run a train on the virgin line? I just wonder how long is she going to be a virgin? It’s good to see investment, but Virgin helped ruin the British railway system, so I’m not exactly pleased about it. Higher ticket prices, less quality and frills you have to pay for, and delay after delay. There’s a reason they lost the franchise rights to services a couple years back. The Orlando to Miami will be a great success. It is still happening. Lots of new technologies to be perfected. You’ll see it in overseas locations first. I really want to believe that brightline will be game-changing, but the more I go on it the more it seems like an extravagant pyramid scheme. It’s currently still faster and cheaper to drive through expess lanes than to take Brightline from virtually everywhere in South Florida which isn’t within walking distance of a station. So why would anyone take it regularly? Currently Brightline consists of mostly empty trains that connect “downtowns” that are packed full of mostly empty luxury condos, with stations that you have to fight traffic to get to anyways, surprisingly high prices…($40+ to WPB?) and no sign of tracks being laid between the coast and Orlando…is this a real partnership or is FEC trying to dump Brightline on some other company before it goes bust? Then you are not giving Richard Branson and Virgin enough credit for this investment. Exactly! Why would a company like Virgin invest in a new intercity train service in Florida if was a money Hemorrhaging fiasco? Stockholders would have a fit. Branson is an idiot most of the time; he trains have issues in Europe and the defunct Virgin American airline he tried here was a disaster. his cruise business seems to be going the same fate. Stupid comment…Virgin America was acquired by Alaska Airlines. Since you make these claims, why don’t you give the facts? Or are you just jacking off at the mouth? You think they built it so that experts like you can judge the results during the first few months or is it a 30+ year investment outlook? Friggin microwave society with no vision!! Leave the infrastructure investments to those with capital and vision while you judge them all you want behind your keyboard. Where did you get the info on empty condos in Miami’s downtown ? Are you from Miami ? Most buildings they are not empty at all.